Another of the many Liverpool lodges’ which follow the ‘Bottomley’ style of working, has just completed its annual installation ceremony in the Roman Suite at Liverpool Masonic Hall. Founded in 1921, St Peter’s Lodge No 4324 will be celebrating its centenary in two years and has always been renowned for its high standard within the lodge room and its enjoyment at the festive board. This relationship between hard work and just reward, has been the key to success for the lodge over many years. This year was no exception, with WM Stuart Kidd giving a very warm welcome to the substantial number of visitors in attendance and expressed his delight that honorary member Bob Jones was fit and well enough to be in attendance. On opening the lodge in due form, ably assisted by his wardens and officers, Stuart swiftly dealt with the regular lodge business, after which came two ballots, one for a joining member, the other for a candidate, both proving in the affirmative. The DC John Lambert then announced the principal guest of the evening Martin Lockyer, stood without. Martin entered the lodge room accompanied by Chairman of the Liverpool Group Mark Matthews, with other grand and Provincial grand officers. The WM greeted Martin, who in return thanked Stuart for his greeting and gave both his personal good wishes and the good wishes of the PrGM, wishing him well for a successful night. Stuart then presented Martin with a cheque in favour of £2,250, for the MCF 2021 Festival. This donation meant that St.Peter’s Lodge had achieved the high status of Grand Patron of the MCF Festival. 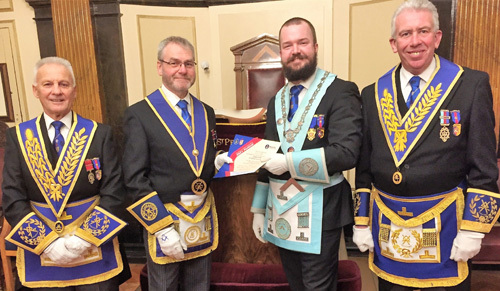 Martin congratulated all of the brethren for their generosity and achievement in attaining this goal and presented the lodge with a Grand Patron certificate. Additionally, it was announced that the lodge had also been awarded the rank of Grand Patron of The Royal Masonic Trust for Girls and Boys and the lodge had received the certification of that honour. He announced that over the years, St. Peter’s had donated in excess of £14,000 to that charity in particular. The next item for the lodge, following on from the usual form of salutations, was the ceremony of installation, for which Stuart requested Ken Bradley to occupy the position of senior warden, Mal Myers as junior warden, with John Doig to continue in position as inner guard. The master elect Stephen Davies, was presented to the WM by his brother Kenneth Davies and then escorted to kneel before the WM to recite his obligation as master elect. The officers of the lodge, having lined up in the north, were thanked for their services, both to the lodge and the WM, after which all below the rank of an installed master retired. Stuart Kidd then conducted the ceremony of installation, ably assisted by DC John Lambert, placing Stephen successfully into the chair of King Solomon. Master Masons, fellowcraft Freemasons and entered apprentices were re-admitted into the lodge and the appropriate salutations given, with all proclamations given by Stuart Kidd. An explanation of the 250th commemorative jewel and the 275th anniversary jewel worn, which are worn by the WM on his collar, together with a description of the newly cast 300th anniversary jewel, was ably delivered by Kenneth Davies, with the brethren showing appreciation in the usual manner. It was then that Stephen Davies appointed and invested his officers for his year in office. A number of addresses were given during the investiture, with the dual address to the wardens given by Adrian Williams. Ken Bradley was on his feet yet again to give the address to the new WM, with Peter Fay addressing the mentor and Geoffrey Green addressing the newly appointed deacons. The final address, that to the brethren of the lodge, was delivered by the principal guest for the evening, Martin Lockyer. Martin Lockyer congratulates new WM. Pictured from left to right, are: Barry Fletcher, Martin Lockyer, Stephen Davies, Kenneth Davies, Marl Matthews and Stuart Kidd. At the conclusion of the installation ceremony, Martin arose to convey the greetings, congratulations and best wishes of the PrGM to the newly installed WM and the officers and brethren of the lodge. It was at this point that Stephen Davies presented further cheques to the value of £350.00, consisting of £100 to Cancer Research UK, £50 to Ring 18 Syndrome (Chromosome Disorders), £100 to Liverpool Masonic Hall building fund and £100 to the Spinal Muscular Atrophy Support group. Martin thanked the WM and the brethren of St Peter’s Lodge for their continuing generous giving. Stephen next warmly welcomed the visitors the lodge, specifically the visiting brethren from Isle of Man and he hoped that they had enjoyed the meeting and that they would enjoy the hospitality of the festive board. One of the Isle of Man visitors, George Waft, explained how his father Albert Waft had been Initiated into St. Peter’s Lodge in 1934, but had unfortunately died a couple of years later in 1937. At the conclusion of the meeting, all present moved into the banqueting suite to toast the newly installed master and then partake of a tremendous festive board. It would be rather amiss not to mention the banquet served on the evening, such was the quality of the meal, absolutely outstanding being the general comment at the tables. The chef, David Atkins, was actually brought in to be thanked and applauded. Later, in responding to the toast to the grand officers, Martin began by saying what a pleasure it was to see so many present to support Stephen at his installation. He spoke at length about the MCF 2021 Festival, also explaining that many members in the Province of West Lancashire had benefited from assistance from the MCF and encouraged brethren to sign up for patron status. There was very little he could add concerning St Peter’s and charitable giving, a lodge that had become both Grand Patron of the festival, and Grand Patron of the Royal Masonic Trust for Girls and Boys. He added how enjoyable the ceremony earlier on had been and it was obvious how much work had been done in preparation. Stephen Davies responded to his toast as WM, by thanking everyone for supporting him on this special occasion, adding that he greatly appreciated their attendance and in particular his brother Ken, who had been the presenting officer and was now SW. He further thanked all those who had delivered addresses and explained the working tools, as well as the lodge secretary Mal Myers, for his work in the background, making sure that everything went off without a hitch. He paid particular thanks to the lodge DC John Lambert and concluded by thanking the brethren who had accepted lodge offices for the ensuing year and assured his audience that he would work diligently for the benefit of the lodge during his year in the chair and beyond. He announced that £170 had been raised at the festive board through a charitable raffle and that the second raffle for a bottle of single malt whisky, donated by John Doig, had raised a further £122, making a grand total of £292. In response to the toast given to the visiting brethren, George Waft thanked the lodge for the kindness shown to him and the other guests. George was rather emotional, when he was presented with copies of the minutes and summons for 1934, at which meeting his father was initiated. Sadly, the evening had to come to a close, but with many friendships made and renewed all made their way home in jocular fashion. A brother’s handshake. Pictured from left to right, are: Barry Fletcher, Martin Lockyer, Stephen Davies, Kenneth Davies, Marl Matthews and Stuart Kidd.